Would it be possible to in a lifetime be elected to serve on the commissions of both Morton and Burleigh County? And be elected to serve as mayor in Bismarck? Truly a man of the peoples; George Peoples (pun intended). Born in Ireland in April 1843 at the height of the Great Potato Famine, George was the son of William and Fanny [Sweeney] Peoples. George immigrated to the United States in 1869 at the age of 22 during the Great Potato Famine. He first appears in North Dakota's history in Cass County, setting up a tent on the west side of the Red River selling hardware and farm supplies to settlers getting off at the end of the railroad line at Moorhead Minnesota as they prepare to travel west. So he was a Fargo area resident in 1871 and 1872. As the railway extends its route west, so travels George. He repeatedly moves his mercantile west as each segment of the Northern Pacific railroad is complete, which would put his arrival into Edwinton (nee Bismarck) in 1873. 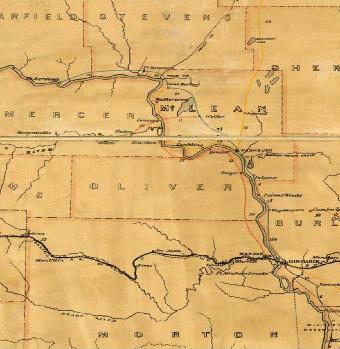 Progress of the rail line across the northern plains would be stymied by the cost of a bridge across the Missouri River as the financial Panic of 1873 forced the NP Railway into bankruptcy in 1875. Finally forced to put down roots, Peoples partnered with Mike Rush to establish a livery and delivery service in Bismarck. 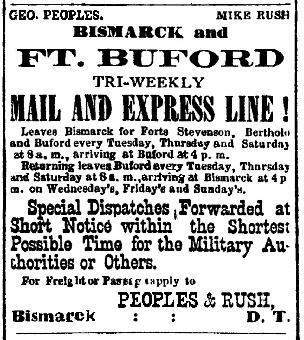 They served the upriver US Army forts at Fort Stevenson, Fort Berthold and Fort Buford/Fort Union delivering supplies and mail from the riverboat port and railway terminus at Bismarck. 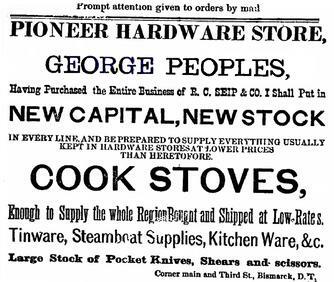 Rather than sell from a tent, as was his prior practice, he purchased a store at Main and Third Streets known as Pioneer Hardware in 1878. Of interest, his competitors McLean & Macnider typically referred to their operation as "People's Supply Store." Not satisfied with only success in business, George Peoples ran successfully for a Burleigh County Commission seat in November 1876. A year later, he ran for and was elected mayor in Bismarck. George Peoples was among the original incorporators in 1879 of Bismarck's first bank and the state's second oldest financial institution "The Pioneer Bank of Western Dakota" (which later becomes part of First National Bank and subsequently today's US Bank system). He was also among the first investors in the new City of Mandan. The March 15, 1879 Bismarck Tribune reported that "George Peoples' ice house under roof" was complete. A second larger icehouse was under construction in November 1886 in block 6 in downtown Mandan to store "enough fine Missouri River ice to meet all demands during the coming summer months." On Monday December 31, 1883, a fire started near the stove on the first story in Peoples Bismarck store located at Meiggs (i.e. Broadway) Avenue and Second Street and destroyed it and the residence on the second floor. 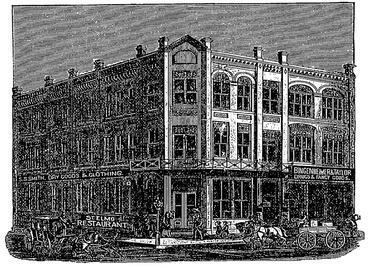 Peoples and his wife would make permenant residence in Mandan at the Peoples Hotel in March 1884. 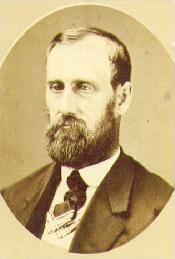 In 1885, he ran for successfully for an open seat on the Morton County Commission. His opponent, Henry Rankin, challenged Peoples' eligiblity for office contending that Peoples had lost that right once convicted of a US felony. Judge Francis acknowledged Peoples was previously found guilty of selling liquor (probably at his hotel in downtown Mandan) in violation of territorial law, he ruled a territorial body did not have the authority to legislate any action as a crime against the United States. Peoples did in fact have the right to hold public office. The Bismarck Daily Tribune took to referring to Peoples as "The Invincible" from that point in time. Peoples led the effort to string a power cable across the river to Mandan to bring electricity to the city in 1887. 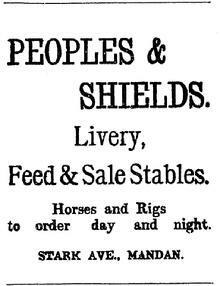 At the time, he and his partner Litten E. Sheilds owned and operated a livery stable, would care for horses and livestock as well as rent and repair horse drawn buggies for the public. The stables were located just north of the Peoples Hotel on what is now Collins Avenue. While he reliquished management of the Peoples Hotel during his service as a Morton County Commissioner in 188501889, he returned to manage the hotel in 1890. Ran for but lost a re-election bid to the Morton County Commission in 1905. Peoples was elected by the respective area voters to served at one point in his life or another as a county commissioner in both Burleigh and later Morton County. Local myth holds that George Peoples was at one time elected mayor both in Bismarck and Mandan. While confirmation of his role as Bismarck's mayor abounds, no evidence of his service as a mayor of Mandan has been identified. George and his wife were married in 1879 at St. Mary's Catholic Church in Bismarck. Teresa E. (Carr) Peoples was born in December 1862 in Pennsylvania from Irish immigrant parents. She was 14 years younger than her husband but 21 years old at the time of the marriage. The couple had a total of seven children, but only three lived to reach adolescence; daughter Frances M. (b. December 1883), William M. (b. March 1887) Robert F. (b. October 1891). 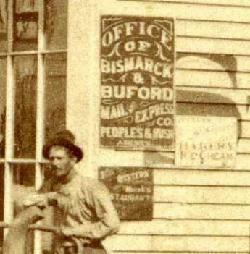 But George sought continued fortune in the mining boomtown of Butte, MT and moved his family there in the mid-1890s. Teresa opened a rooming house at 114 Dakota Ave less than half a mile from the Anaconda copper mine and only blocks from the city's famous "red light district" on Mercury Street. Brothers Cornellius "Con" and Patrick operated Peoples Bros. Saloon at 324 N Main Street, one of hundreds of saloons in the city at the time. George's younger brother James also moved to Montana and worked there as a driver. Teresa Peoples remained in Butte, Montana the rest of her life. George was listed in Butte in both the 1900 census and 1910 census but his personal bankrupcy declared in 1904 may have prompted his return to Morton County where he was elected to the commission and served here in 1905. George died in Butte Montana on July 12, 1918. Teresa died on on November 9, 1937. Note: The 1880 census shows two George Peoples living in Bismarck, one in his early 30s as head of household and the other older George Peoples in his mid 50s. The census taker listed the older George as a "brother" to the head of house hold, when he was more likely a cousin, a child of Connell and Mary [Roarty] Peoples of the Gweedore area of County Donegal. The Society would like to thank Cornelius Warren, grandson of Con Peoples and Joe Bradley who is the great nephew of George Peoples and great grandson of Cornelius Peoples for providing information of the parentage of the brothers and sharing other information with us). But the date of George's birth and death was updated in 2017 to reflect information obtained at the St. Patrick's Cemetery Butte MT, the site of his grave.